Strapped into the trunk of a Toyota sedan, the smiling face of a deity draped in plastic flowers rolls slowly down a suburban Long Island street behind a crowd of chanting women in saris. Holding up golden pineapples wrapped in red and gold ribbon, the small parade processes past a car wash and around the block until it returns to the temple, a former synagogue facing the Long Island Rail Road tracks. The circuit through the neighborhood is meant to make the deity feel at home in its new surroundings. For the Afghan Hindu congregation following along on a recent Sunday, some wearing only socks, the ritual appears to serve a similar purpose. Before they were forced to wear yellow badges to mark their status as a minority, and before they fled their homeland as persecution and discrimination worsened, the Hindus of Afghanistan were a proud people who traced their history back for centuries. Dr. Ram, an orthopedic surgeon who once served in Afghanistan’s Ministry of Health, moved to New York City in 1994 as economic conditions deteriorated in the country and not long before the Taliban began forcing Hindus to wear badges. He brought his family to join others in the tightly knit community that first settled in Flushing, Queens, in the 1980s. He imagined going back someday. Now, as the Taliban-led insurgency in Afghanistan appears to be gaining new ground, the city’s growing community of Afghan Hindus is resigning itself to permanent exile in America. Generations ago, Hindus ruled Afghanistan, community leaders here say. They started the first banks and were prominent in the business sector, and they were well-respected by their Muslim countrymen. The two groups lived together relatively peacefully, even as their country was riven by ongoing civil conflicts, and skirmishes between Pakistan and India dominated the region’s news. These days, only a handful of Hindus live in Afghanistan, the leaders say, and the resurgence of the Taliban — highlighted by Vice President Cheney in a trip to Kabul last week — has sent tremors of fear through those who remain. Many of the temples have crumbled, while areas once reserved for Hindu funeral pyres have been taken over by the Afghan government for other uses, the leaders say. Yet as the Hindu community has faded in Afghanistan, it has flourished here. Community leaders now estimate that about 220 Afghan Hindu families, or 3,000 people, live in and around New York City. In 1998, led by Balram Kakkar, a lawyer who started his own firm, the group founded its first temple on Bowne Street in Flushing, on a strip lined with other Indian temples. Most Afghan Hindus are Punjabi and have blended into the neighborhood, though the Afghans’ history has kept the ties between them strong. Adjusting to the wider society in New York also has been relatively easy for the community, which held an economically privileged position in Afghanistan. Many have moved out of the city to the suburbs. In 2005, the temple bought a building in Hicksville, L.I., that was once a synagogue, to replace the smaller space on Bowne Street. In the past few months, the community has been working to get settled at the new location, where leaders now predict they’ll stay for years to come. Still, many mourn the loss of land and heritage. Some hold on to wistful hopes of return. On the temple’s Web site, young graphic designers who belong to the temple have posted a futuristic architectural rendering of Kabul. In the picture, the streets are lined with trees and sleek modern buildings. The rendering is based only on their imaginations, however, and Mr. Kakkar said the temple would likely take the picture down soon. Nearly 4,000 Sikh and Hindu refugees from Afghanistan, who are back due to civil war, are peeved at the lopsided citizenship norms of the Indian Ministry of External Affairs. Though 205 Hindu and Sikh refugees from Afghanistan have been granted Indian citizenship, many are unhappy, as their families are still living like refugees. The refugees have crossed the mandatory stay period of 14 years in the India are tired of living with the ‘Afghani’ tag. “Though we will not be able to forget Afghanistan, now India is our country and our children have grown up here. But authorities taunt us why don’t we go back to Kabul. It seems that we will never be accepted as Indians,” said 57-year-old Narendra Singh. Singh is waiting to get Indian citizenship along with his wife, son and daughter-in-law. “Even after living here for so long and being of Indian origin, we are not able to get the basic things to run our life like ration card, voter identity card, driving license etc. My son had to start a small business due to lack of any government job,” he said. Fifty-six-year-old Ardet Singh’s happiness is almost palpable when he shows the photocopy of the citizenship certificate awarded to him six months back. However, the next moment he is completely blank. After 16 years in India, he still yearns to see his family members as Indian citizen. Singh applied for an Indian citizenship in 2003 with his wife and two children. Though Singh got the citizenship last year other members in the family are still waiting for the initial police verification by the Foreigners Registration Office (FRO) in Delhi. “I call them almost daily to get the police verification done so that the application can move forward. However, it seems like they have lost the application form,” said Singh. “We were happily living in Afghanistan with an Indian identity. But after the Taliban came to power we were expelled and we had no other option apart from seeking refuge in India. We hope the United Nations High Commission for Refugees (UNHCR) would do something,” said Ardet. UNHCR is trying to expedite their cases with the concerned departments. “There are a total of 8,500 Afghan (Hindu and Sikh) refugees but so far only 205 have been granted citizenship. In February, 64 people were awarded citizenship, which is the highest figure in a month so far,” said Nayana Bose, associate external relations officer, UNHCR India. UNHCR recently opened two naturalisation clinics in Vikaspuri and Faridabad. “In UK, the naturalisation process taken only five years while countries like Sweden, Canada, Belgium, Germany and Ireland requires only three years of stay to accept refugees as their citizens. When we migrated, the mandatory stay period in India was increased from 7 to 10 years. 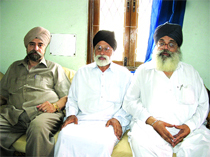 It was again increased to 12 years few years back,” said Manohar Singh from Khalsa Diwan Welfare Society, NGO which is working for the welfare of the refugees.